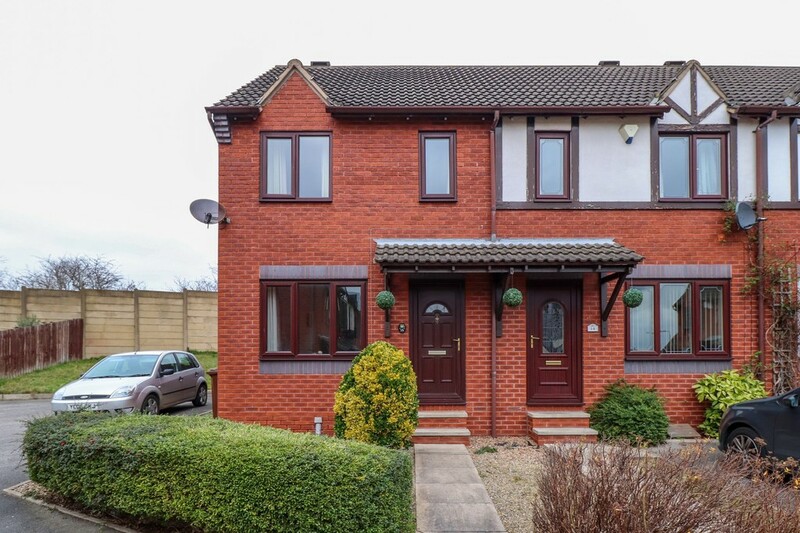 Enjoying a cul-de-sac position is this END TOWN HOUSE, which benefits from TWO GOOD SIZE BEDROOMS, a modern fitted house bathroom, a spacious kitchen diner overlooking the low maintenance rear garden, TWO ALLOCATED PARKING SPACES, UPVC double glazing and gas central heating. An internal viewing is recommended and the accommodation briefly comprises of living room, kitchen diner, first floor landing, two bedrooms and modern fitted house bathroom/w.c. Outside, to the front there is a low maintenance pebbled front garden, whilst to the rear there are two paved patio areas and pebbled surround enclosed by timber panelled fences. The property has two allocated parking spaces at the side of the property within the communal car park. The property is located within close proximity to Horbury town centre, which benefits from restaurants, schools and amenities. Local bus routes travel to and from Wakefield city centre and the M1 motorway is only a short distance away making centres such as Manchester and Leeds accessible on a daily basis by car. Only a full internal inspection will reveal all that is on offer at this quality home and an internal viewing is recommended. LIVING ROOM 13' 3" x 12' 8" (4.06m x 3.87m) UPVC double glazed front entrance door. UPVC double glazed window to the front aspect, coving to the ceiling, central heating radiator, staircase leading to the first floor landing, door to the spacious kitchen diner at the rear. Living flame effect gas fire on a granite hearth with matching interior and a wooden decorative surround. KITCHEN DINER 8' 11" x 13' 3" (2.72m x 4.06m) Fully tiled floor. A range of wall and base units with laminate work surface over and tiled splash back above, 1 1/2 stainless steel sink and drainer with mixer tap, integrated oven and grill with four ring gas hob and cooker hood over, built in wine rack, downlights, UPVC double glazed door with frosted panels leading to the low maintenance rear garden, UPVC double glazed window to the rear, central heating radiator, space for fridge freezer, plumbing and drainage for a washing machine, dado rail, coving to the ceiling. FIRST FLOOR LANDING Coving to the ceiling, doors to the two bedrooms and house bathroom/w.c. Loft access. MASTER BEDROOM 9' 3" x 13' 3" (2.84m x 4.06m) Two UPVC double glazed windows to the front, central heating radiator and coving to the ceiling. BEDROOM TWO 8' 11" x 8' 11" max (2.72m x 2.73m) x 6'11" min (2.11m) UPVC double glazed window to the rear elevation, central heating radiator, door providing access into the airing cupboard with fixed shelving. HOUSE BATHROOM/W.C. 5' 5" x 6' 0" (1.66m x 1.84m) Modern fitted bathroom suite comprising a three piece suite of panelled bath with mixer tap and separate electric shower over bath, low flush w.c. and pedestal wash basin with chrome mixer tap. Chrome ladder style radiator, fully tiled walls and floor, UPVC double glazed frosted window to the rear elevation and wall mounted extractor fan. OUTSIDE To the front of the property there is a low maintenance pebbled front garden within paved pathway leading to the front entrance door. To the rear of the property there is a paved patio area and a low maintenance pebbled garden. A further paved patio area is ideal for entertaining and dining purposes. Timber garden shed and timber panelled fence surrounds. Gated access to the communal parking area at the side and the property has two allocated parking spaces. VIEWINGS To view please contact our Horbury office and they will be pleased to arrange a suitable appointment.